Hypothalamic control of energy homeostasis. The hypothalamus senses and integrates feedback from adipostatic hormones, which circulate in levels proportionate to nutritional status and adipose tissue stores. Insulin and leptin act directly on neuronal subsets in the ARC of the hypothalamus to control energy homeostasis. Through activation of POMC neurons and inhibition of AgRP neurons, adipostatic signals activate MC4R-expressing neurons in the PVN. During fasting conditions, the expression of AgRP increases, whereas POMC expression is reduced, resulting in decreased MC4R signaling. In the fed state, AgRP levels are diminished and POMC levels increase, which triggers MC4R signaling and culminates in satiety and stimulation of energy expenditure. 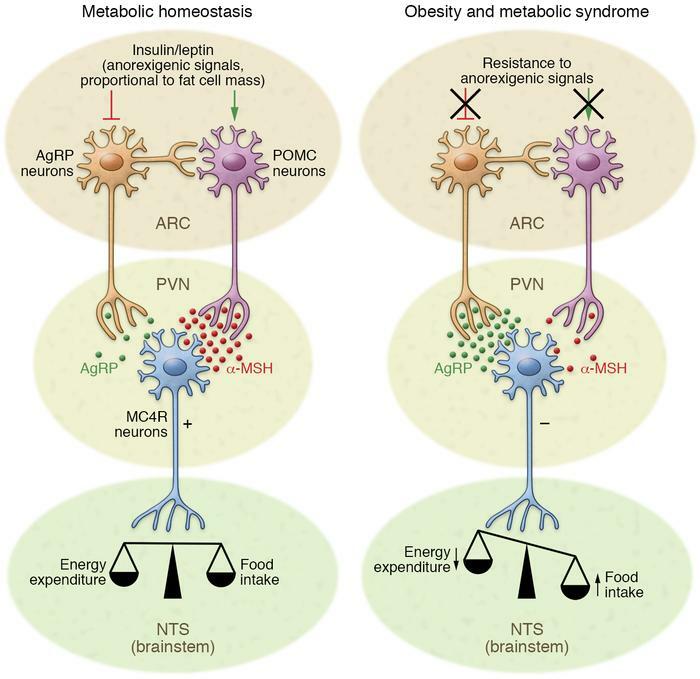 Neuronal inflammation and the subsequent insulin and leptin resistance of ARC neurons disrupts this metabolic feedback loop, further promoting increased food intake and body weight gain.